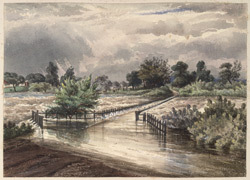 'Holkar's Bridge near Kirkee (Poonah) during a flood. 28 July 1870'. bl.uk > Online Gallery Home	> Online exhibitions	> Asia, Pacific and Africa Collections	> 'Holkar's Bridge near Kirkee (Poonah) during a flood. 28 July 1870'. Water-colour painting of Holkar's bridge at Pune in Maharashtra by John Frederick Lester (1825-1915) dated 28th July 1870. This image is from an album of 30 folios with laid down water-colours made between 1865 and 1877 in Kathiawar, Bombay, Poona, Mahabaleshwar and Savantvadi. The Holkars were the Maratha rulers of the Malwa region. The founder of the dynasty was Malhar Rao Holkar (1694-1766) who was a general of the Peshwas but eventually became independent and ruled Indore in the 18th century. Holkar’s Bridge was built by Madhu Rao Peshwa and so named because Holkar was accustomed to pitch his tents in its vicinity. The bridge spans the River Mula at Kirkee, is 548 feet long, and built of stone and lime masonry. The rivers Mula and Mutha receive heavy rainfall in the Monsoon season of June-September. The water originates from the Western Ghats, approximately 70 kilometres from Pune.